Catalog your DVD collection. Automatically scan your video files. Rate what you've watched. Get personalized recommendations matching your tastes. Easily decide what to watch on TV, in theaters, on Netflix. Discover great movies and series that you would have missed otherwise. We live in a golden age where there are more great shows available than you can possibly watch. Why waste your time watching an average show when you could be watching a much better one? This app can understand your tastes and point you towards the shows that you'll enjoy the most. 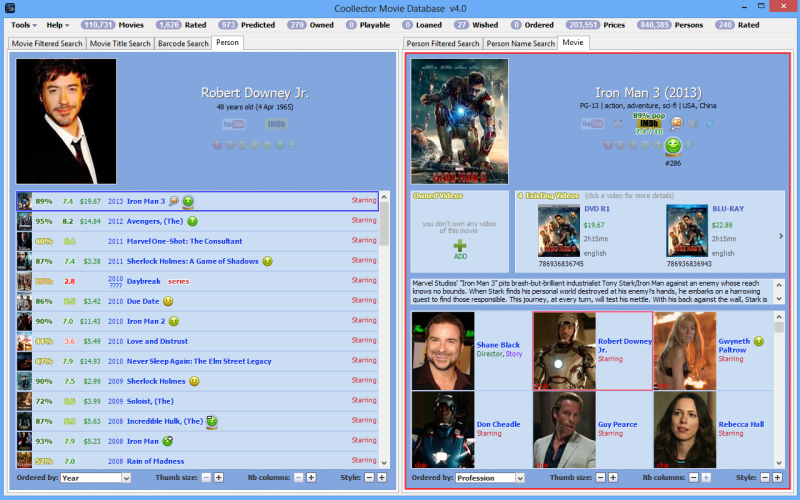 Coollector Movie Database is a FREE Mac/Windows software. No crippled feature or time limit. There's only a 30 seconds window on startup that you can remove by becoming a contributor. April 04, 2019: version 4.13.2 is released. Coollector Movie Database is a welcome alternative to decide what to watch on Netflix. The recommendations are accurate and unbiased, and it's much easier to browse or filter the whole Netflix catalog (the app knows the catalogs from 30 countries, updated daily). Netflix is a great service, offering lots of shows for a low price, but their user interface has gone downhill... Many shows are buried and nearly impossible to find, their recommendation system is blatantly biased toward their Netflix Originals, you can only thumb up or thumb down a show, the percent match scores are all wrong, you can't mark a show as "not interested", you're recommended shows you've already seen, and the auto-playing previews can be quite intrusive. With Coollector, hunt less, watch more! Please note that Coollector Movie Database can import your thumb ratings from Netflix, as well as your old star ratings and your wishlist. Here are the instructions to import from Netflix. This software is free, but contributions and donations are welcome. Coollector Movie Database exists since more than 10 years and has been continuously improved. If you're a fan and want to support our work, you can become an official contributor. 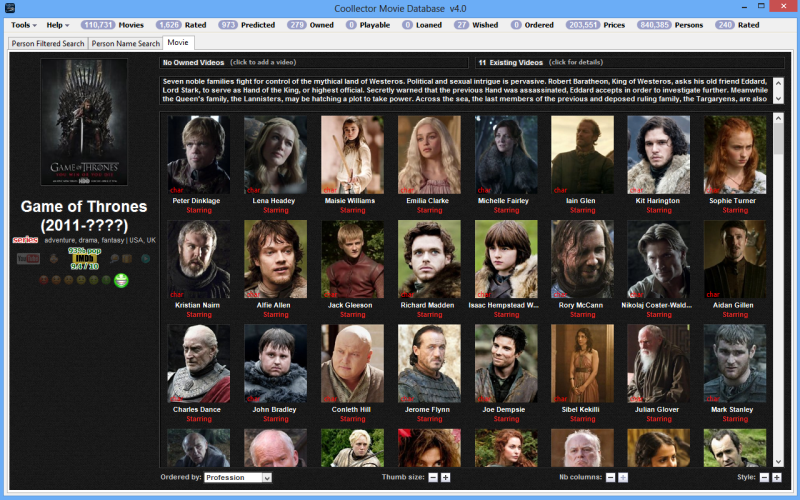 Method 1: contribute 100 character pictures to our database. Method 2: donate $9, we accept Credit Card or Paypal payments. Any of those methods will get you a Contributor Code that removes the 30 seconds startup. about it. I'm very thankful to the users who contribute, it's their giving back that makes all this possible. contributing pictures after they got their code, etc... I'm proud we've gathered such a great community! Track what movies and series episodes you've seen, and how much you've liked them. 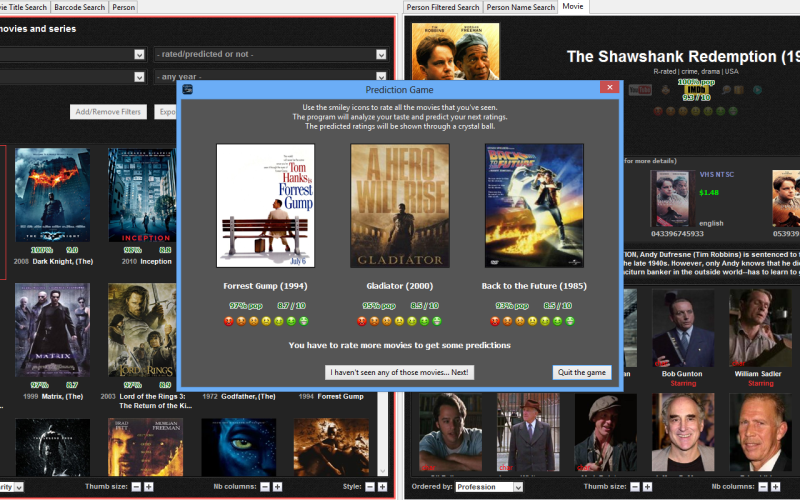 The program will analyze your tastes to give you personalized movie recommendations. Remember what DVDs you own, where they're stored, and which ones you've loaned. You'll easily organize your video files too, by scanning your disk automatically. This software includes a vast database of movies and series, richly illustrated with movie posters, person pictures, and character screenshots. The interface is highly customizable, with skins and adjustable layouts. It's easy to make any search you can think of. You can publish your data on the internet, to access it from anywhere or to show to your friends. Rating the movies you've seen is an important part of the program. Our rating system is very easy to use. You mostly have 2 questions to ask yourself... Is it a bad movie? And if it's not bad, will you watch it again? Click this link to read the rating guidelines. NETFLIX & HULU: browse their catalogs of streaming movies and series to conveniently decide what to watch. It can be an alternative way to get better Netflix recommendations, especially after Netflix recent changes (star ratings replaced by thumbs up/thumbs down, bad predictions, and Netflix pushing down your throat their in-house productions). The prediction game makes it fun to rate all the movies that you've seen. There are many ways you can customize the layout to your liking. You can change the entire look of the app, by choosing a different skin. Instead of buying the app, you can earn it by contributing 100 character pictures. 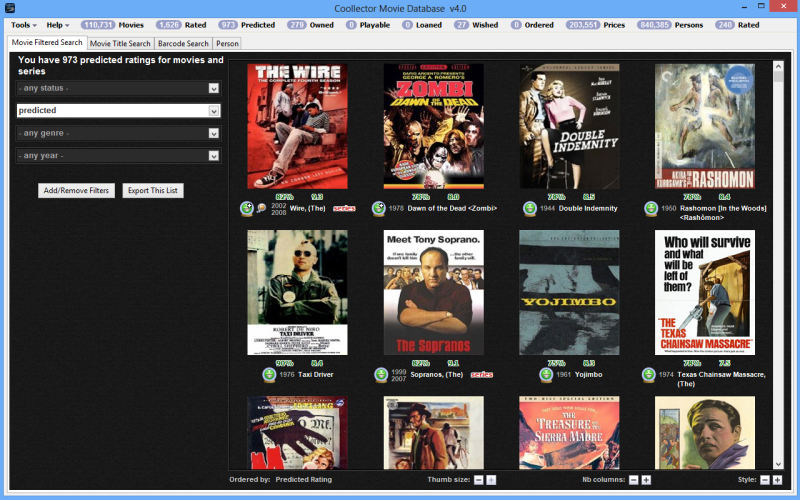 Coollector Movie Database is the only program of its kind! It's a personalized film database and at the same time a video collection organizer. All the alternative softwares are simply video collection organizers, where you start with an empty database, and must download information for each video, one by one. 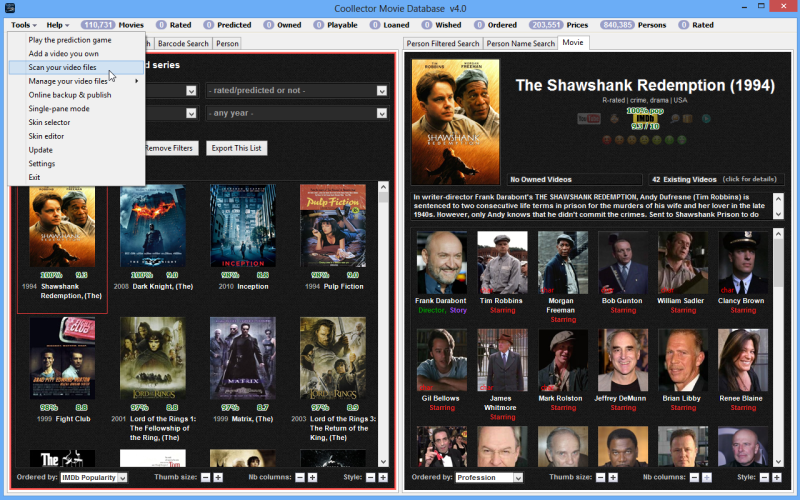 With Coollector Movie Database, it's completely different. Right from the start, you have an entire encyclopedia with nearly all the movies and series that exist. Since it's installed on your computer, you can use it even when you're offline. The interface is very easy to use, and richly illustrated with film posters, video covers, photographs of actors and crew, and even character screenshots. You can customize the layout to your liking, and make almost any search you can think of, without needing to be a database engineer. The best part is that you can personalize that movie database. You can rate a film to remember whether it was good or bad. You can track which part of a series you've already seen, by rating whole seasons or individual episodes. You can tag the movies and the persons with any words you want. You can organize your video collection, remembering what you own, where it's stored, or what you've loaned to whom. You can create a wish-list with all the movies that you'd like to watch. All those personalizations are clearly visible: movies that you own are highlighted, and colored icons will instantly remind you of how much you like a movie or a person. Movie lovers will get enough hints to decide what to watch from their own collection, on TV, in theaters, or on streaming services like Netflix and Hulu. Does the movie have actors whom you like? Have you seen other movies from this director? At first glance you'll have all the answers! To help you even further in your choice, the app displays the IMDb rating and popularity of each movie along with a link to trailers on Youtube. Last but not least, the personalized movie recommendations are an instant way to know how much you'll like the movies that you haven't seen yet. Video collectors will easily catalog their entire DVD collection as well as organize their movie files by scanning their disk very quickly and identifying the files automatically. Once added, you'll be able to launch the files from within the app and they'll be played with your favorite media player.